After both the bushfires and the recent explosion on the asylum seekers' boat, Mr Rudd expressed himself with uncharacteristic vehemence. In the first case he spoke of the evil of arson, and in the second he said that people smugglers could rot in hell. This kind of language echoes the tabloid characterisation of people who have done particularly foul deeds as monsters. Such strong language serves many purposes. It insists that there is a clear difference between right and wrong, and that moral standards are objective, not subjective. It cuts through moral complexities and through arguments that would diffuse or minimise the moral culpability of the perpetrators of monstrous deeds. It also separates evil-doers from 'people like us', and effectively excommunicates them from society. Arsonists and people smugglers have abandoned themselves to an evil that is alien to the rest of us. By denouncing and excluding them we keep ourselves untainted by their evil. This view, for all its uses, contrasts with the Christian view of moral evil. The Christian view is more complex and holds together under tension three different insights. First, it sees sin as pervasive, present in every human heart, and as distorting every relationship and institution of society. Because sin is so pervasive, the crucial line of separation does not lie between monsters and ordinary human beings. It lies between movements of the human heart that are open to God and others, and those that are selfish and possessive. The difference between Hitler and ourselves is one of degree, not of kind. Of course, simply to insist that sin is ordinary and universal risks domesticating it. If there is a little Hitler in every human being, then what Hitler did could also seem to be of little significance. The second strand of the Christian view of sin is to recognise its destructiveness. When we choose our individual interests over our relationship to God and to others, we incalculably harm both our world and ourselves. The BrisConnections business illustrates this. The greed of the parties who structured the deal, lured investors into it and served their own interests in resolving its conflicts is ordinary enough. But its drabness may cause us to neglect the potential damage done to society when it leads observers sensibly to decide that neither the parties to the dispute nor similar financial organisations are trustworthy. Such withdrawal of trust led to the Recession and its diminishment of human lives. To recognise simultaneously the havoc that sin wreaks in individuals and society, and its pervasiveness in all human lives and relationships is challenging. It seems to encourage a grim view of the world. Indeed it is no wonder that people associate negativity and repression with Christianity and with any emphasis on sin. So the third strand of the Christian view of sin is also central. It is that God has overcome evil. So we can look honestly at our own lives and realistically at our world, confident that the Good News has outrun the bad. The Christian attitude to people who have done monstrous deeds is complex. It encourages us to begin by seeing them as people like ourselves who are held in play by God's love. We recognise the twisted knots of motivation in them and the factors that lessen moral culpability. We also give weight to the harm they have done. That does not deprive them of the respect to which they are entitled by their shared humanity. Seen in this light, the incident involving people smugglers and asylum seekers requires a more complex view than that taken by the Prime Minister. We should look carefully at all the people involved. They are human beings like us, and the line of sinfulness runs through them as for us. But they are also caught up in the sin of others — embodied in the Russian occupation, the initial encouragement of the Taliban for geopolitical ends, the current military action, and the ethnic hostility between different tribal groups in Afghanistan. We should also give full weight to the selfishness that has led Australians to evade the claims that asyulum seekers make on us by virtue of their shared humanity. This is embodied in the artificial devices used to exclude asylum seekers, the pressure previously put on asylum seekers to return to their death in Afghanistan, the forced separation of refugees from their families through Temporary Protection Visas and so on. But our focus throughout ought to be on the people caught in this story who are like us. They include the asylum seekers, the people smugglers, the officials administering an unjust policy, and Mr Rudd himself. Each makes claims on us that should be heard and judged. All are entitled to receive a hearing and a just judgment. I concur with Andrew Hamilton' perceptiveness that people smugglers "are also caught up in the sin of others" Perhaps Rudd's condemnation is a matter of guilty projection. The leaders and politicians who voted for and maintain the Afghani and Iraqi wars for oil have committed the root sin from which the asylum seekers flee. I wonder what is the respective national refugee quota of the Coalition of the Willing and NATO members for the suffering, grieving, injured, traumatized, orphaned, uprooted victims of their attacks, invasions and occupations? And I wonder how many local staff serving the occupied forces like those of Australia have been guaranteed and provided with protective refuge? If people didn't need to escape violent tyranny, people smuggling businesses would cease. Smugglers would reverted to transporting other tradeable commodities, such as weapons, ammunition and opiates, for which there is ongoing demand. From a free market perspective, Mr Rudd's hyperbolical vilification of people who are providing a service for which there is demand is no more than a ludicrous precursor to such market-distorting interventions as sending out the gunboats. It will be expensive, arbitrarily draconian, timed to meet Anzac Day deadlines, and ultimately futile. Only by ending the need for people to seek refuge can any politician hope to end people-smuggling ... should a politician devise a way for this to occur, he/she would have progressed from politician to humanitarian. A very fine, and eminently sane, piece of writing. This is a terrific piece Andrew, really one of your best...and that's saying something. I really like the nuanced approach you take, developing, as you do, the boundaried nature of Christianity. Congratulations. Thank you Andy. It’s always disquieting to hear anyone, let alone the head of our democratically elected government, start to hand out places to hell. Being the consummate political animal he is, I suspect Rudd was trying to bolster support for his more humane response to asylum seekers by tapping into (though not fully embracing) the hostility many Australians feel towards those who arrive by boat; shrilly demonising people smugglers so as not to appear ‘soft’ on asylum seekers. Although by inferring the current governments approach is humane, with refugee advocates still scrutinising the workings of mandatary detention and the practice of excising offshore islands from the migration zone, this also is a matter of degrees. Something about how Mr Rudd has responded to those situations has niggled at me. Thank you for putting a finger on it, and using it to illustrate something broader for everyone to consider. It is with clarity and simplicity that Andy Hamilton outlines a Catholic response to the chorus of vitriol that feeds our capacity to retain a strong sense of separation. Politicians have a really tough job. Politicians rely on the 'them and us' factor to stay in power. Then again, they also have opportunities to speak of our common human unions that enjoin us. I think they need our encouragement to do so. As I read this article, I was reminded of the work of Rene Girard. Girard’s summation and explanation of how societies, groups and individuals are enslaved to the notion of scapegoatism are illuminating. Each of us is required to traverse our own hall of mirrors as we navigate values, relationships and wider questions of morality, but when we are finally gifted with glimpses of the breadth and depth of love, acceptance, compassion and forgiveness, it is then that we naturally respond to the anger and denigration with a voice that comes from a different place. The faith perspective we have to share is that we are not alone as we make these rites of passage. Andrew Hamilton has cut directly to the nub of this complex issue and has deftly separated the 'political and media chaff from the wheat'. Thank you Andrew, for your reminder of the part we play in the actions of these 'evil people smugglers'. Our silence when refugees are denied entry and our tacit acceptance of the decisions of whichever government is in power speak volumes. The entire article and particularly the last four paragraphs hold so much truth and wisdom to remind us of who we are and from which we can learn. I, too, found Mr. Rudd's comments re people smugglers rather odd - looking into his face, those words weren't there! Ah, well, what's new? Well said Andrew, will you be sending a copy of this to our PM? It was wonderful to hear you on the radio the other day chatting to Gary Boderhoven. I too was taken aback by the vehemence of Mr Rudd's condemnation of people smugglers to the fires of hell. It was declared with all the assurance of one who possessed the Divine Right of Kings. I had thought the PM had accepted the Anglican form of Christianity in order to escape the excesses of Roman Catholicism he experienced as a youth. However it would seem that the concept of eternal punishment by an unforgiving God is useful shorthand for "It is okay never to forgive some people with utter hatred." Not a very good principle to carry into negotiations between nations nor into the democratic process. Thanks again, Andy, for suggesting a broader context in which to understand this matter. I was deeply offended by Rudd's off the cuff words, unworthy of a Christian. Great article clarifying a Christian view. I have forwarded your article to Peter Dutton, as I live in his electorate and feel his own views leave something to be desired. Words levelled at his opponent may have an impact on this unduly influential conservative minister. 'Judge not that ye be judged'. Heard that one, Mr Rudd? Here you stand, a millionaire in charge (hopefully) of your country, yet you condemn these smugglers and asylum seekers - seekers who are so desperate for a home they must risk their lives to find one. They don't have a choice, but you do. Act with some humanity, if you can find any within you. You're supposed to be a leader, for god's sake be the kind of leader we would want to follow. Kevin Rudd is, of course, an Irish Australian and I've noticed both the Irish and the Italians use language very often more as an expression of feeling as they might use it to convey meaning. Rudd is expressing disgust, as one might of the actions of paedophiles or terrorists. The moral point to be made, I believe, is that unqualified castigation of someone by anyone else is also a morally diminishing act by and for the speaker. But Andrew, I don't hear you recognising the validity of moral outrage in Rudd's case. Can't we also call it as it is and recognise that the castigation of evil acts by self interested and exploitative people should be condemed - such as occur in public (as we can see in for example in Zimbabwe) or in private as we experience from time to time in our own lives. I'm troubled that seeing the tripartite circumstance as you explain can paralyse response. I really enjoyed this article, Andrew, especially the clear explanation of the Christian view of moral evil. Thank you Andrew for this piece. 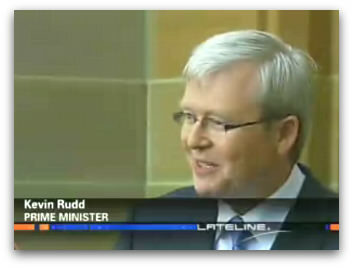 I was very disappointed to hear Mr. Rudd speak this way. I was hoping for more compassionate leadership for our country. Your article expresses my belief very well. Those who crew the boats, we call them people smugglers, as far as I can see risk their life and if successful a significant jail sentence - maybe 6 years. To give up that much, at worst your life at best a long stretch of life in a foreign jail is quite a price to pay for the benefit of their families and loved ones they leave behind. I wonder if I would be prepared to gift so much. Andrew, thank you for a clear and helpful piece. Thank you very much Andrew Hamilton for the article and Vic O'Callaghan for your comment - each a bright light in the fog. I am sympathetic with Michael Kelly's concern that evil deeds should be so named. The problem with the castigation Rudd employed was he played the man and not the ball. He attacked the person not the deed. There seems to be a tendency in some circles to return to a simplistic mediaeval concept of heaven and hell. In the 1960's Creation Spirituality gave us now insights into the positive aspects of the Gospel.Even the most sinful of people can be transformed by the power of the Spirit.We are all made in the image of God. No-one is beyond redemption. From the time Jesus decried the Pharisees for their adherence to rules over freedom and love, the leaders of radical Christian ministries have found themselves in bitter contention with their superiors. Peter Kennedy is no exception.